This was my second and a half time visiting Crater Lake National Park in southern Oregon. It is one of the 7 wonders of Oregon, according to Travel Oregon, and so far it is my favorite. 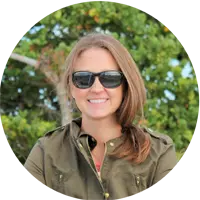 Being raised on the beaches of Florida, I have always loved water. The ocean waters have always made me feel more peaceful, and while I love the vastness of the ocean, some of the lakes of the Pacific Northwest are beginning to rival its beauty. Crater Lake, Oregon is the deepest blue color I have ever seen. When comparing it to the turquoise lagoon waters in Bora Bora I got to see last year, I’m not sure which is better! The first half time I visited Crater Lake was in January. My husband and I were driving South from Bend, Oregon to California and we thought we would stop there on the way. Little did we know that the North entrance to the park is closed all winter due to snow. The only way to access the lake in the winter and early spring is from the South entrance, and we just didn’t have the time to drive all the way around to get to it on this trip. 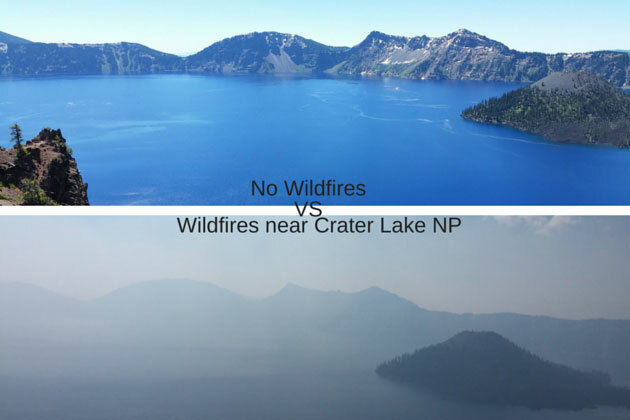 You definitely have to make an effort to go to Crater Lake because it’s not really “on-the-way” to anything. 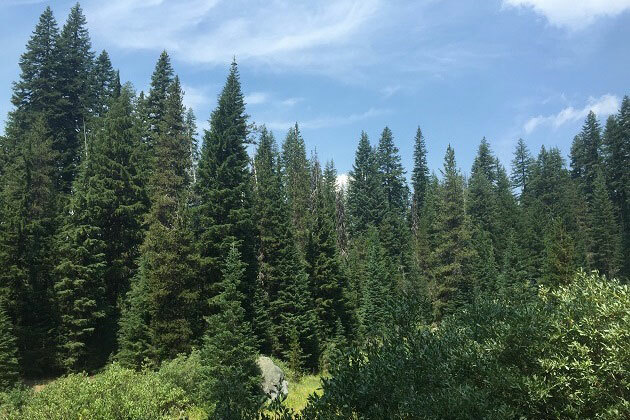 With Klamath Falls being the largest town near the lake, and still 60 miles away, it is off the beaten path of civilization. But, I have made up for my half trip to Crater Lake by having visited (for real this time) two more times this summer. The first visit was when my in-laws came to visit in June, and the second time was with my parents in August. 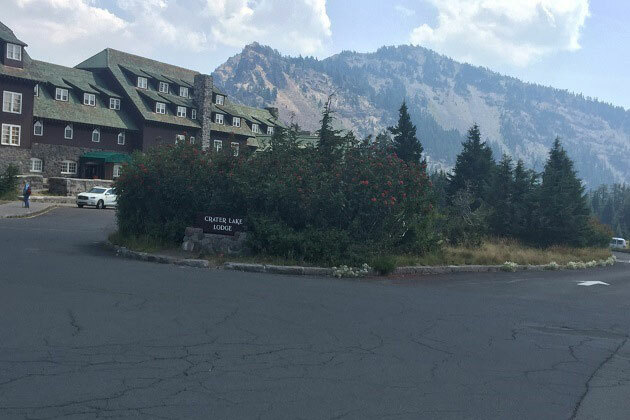 On my June visit, we stopped at most of the amenities at the park: the gift shop, the visitor’s center, the Crater Lake Lodge, and drove around the entire Rim Drive which had just opened up a few days before we got there. Score! Taking the 33-mile drive around the rim is an absolute must if you get there after it fully opens (typically in mid to late June when the snow is all melted). There are 30+ pullouts to stop along the rim, all with incredible views. Be sure to stop at the Wizard Island overlook. Along with the pumice castle, these are some of the more well-known landmarks of the lake. On my August visit, we were all ready for a day of sightseeing at the lake. There was a large wildfire happening close to the lake, so the deep blue views were a little overshadowed by smoke. You can see the difference in the clarity between my visit in June and my visit in August. We could actually see the wildfire from the rim of the lake. The wildfire smoke did clear out a little as the day went on. But regardless of the smoke, we didn’t let it stop us from seeing some gorgeous sites in the park. Some hidden gems that are still worth a visit. These hikes are all very family-friendly, with clearly marked trails and short distances. Sun Notch – This hike is a quick 0.5 miles to a great view of the phantom ship. It is listed as a moderate hike due to the slight elevation change, but I’d say it’s doable for most. The trailhead is accessible from the East Rim Drive. Castle Crest Wildflower Trail – Even though we missed the wildflower blooms, this easy 0.4 mile loop hike was still worth it. Try to get there in July to catch the wildflowers in the meadow. I’m sure it is beautiful! The trailhead is located on the East Rim Drive, very close to park headquarters. 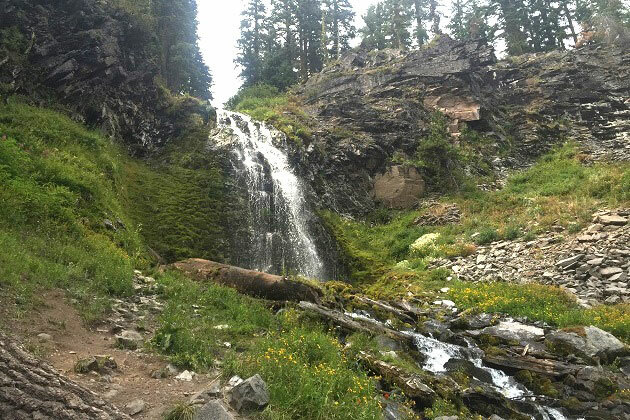 Plaikni Falls – This hidden waterfall, located on the Pinnacles Road, is an easy 2.0 mile hike to the falls. It’s off the main rim drive and is a little less crowded than some of the other hikes. The walk through the forest to the falls is very peaceful! This was my favorite hike of the day. Pinnacles – At the end of the Pinnacles Road is another short and easy 1.0 mile hike that gives you great views of the Pinnacles. 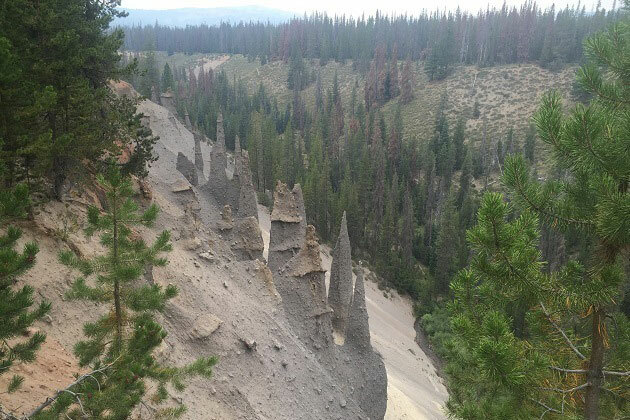 These are spires sticking up out of the side of the mountain, made of volcanic ash. They are a pretty unique site to see, and worth the 7-mile drive off the rim drive to get there. 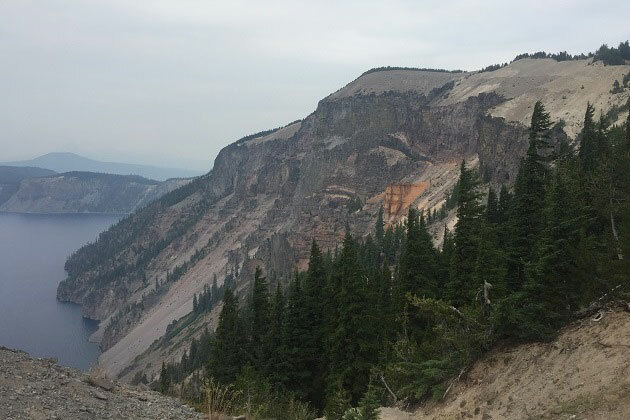 While I have seen a lot on my visits to Crater Lake, there are a few hikes that are still on my to-do list. These are some of the more strenuous hikes in the park that Wes and I will need to go back to do on our own. Cleetwood Cove Trail – This is the only trail that takes you to the shore of the lake and looked to be very crowded. The only problem for some people is that it is a steep strenuous 2.2 mile hike. But, if you are set on dipping your toes into the lake, or you want to take one of the boat tours to Wizard Island, this hike is a must. It is definitely on my list of things to do at Crater Lake on my next visit. 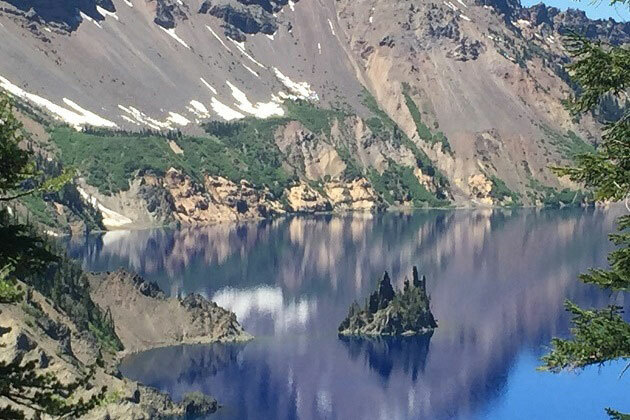 Garfield Peak – Giving you some of the best panoramic views of the lake, this 3.4 miles hike is listed as strenuous due to the elevation change. 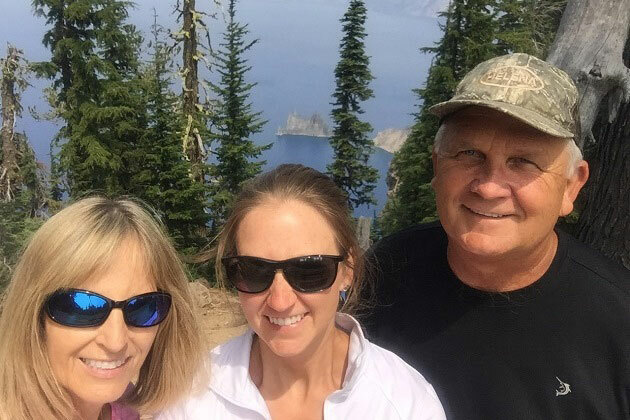 This is another hike on my Crater Lake list for a day when I have a little more time and am up for more of a challenge. 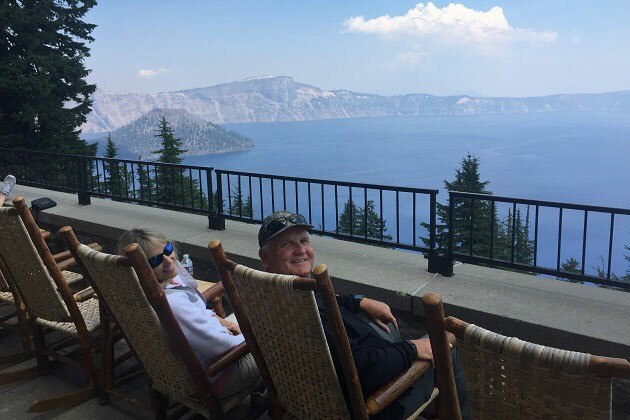 Once you’re done with sightseeing, hiking, and exploring at Crater Lake I must recommend that you visit the Crater Lake Lodge and enjoy a little break in the outdoor rocking chairs. We brought some snacks and sat out there to relax and enjoy the view while we ate. The Lodge is open for overnight guests, but reservations are recommended. 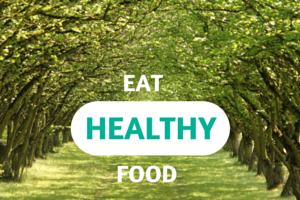 Even if you’re not staying at the lodge, it’s worth a visit. 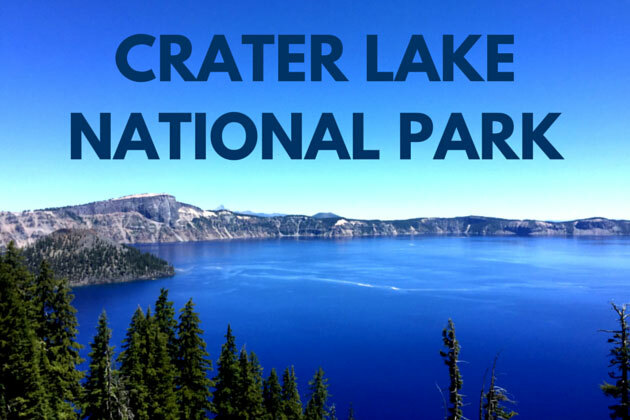 Have you ever been to Crater Lake National Park? What’s the most beautiful lake you’ve ever seen? Wow, that looks amazing. We just were at the Grand Canyon so I’m looking for our next fantastic hiking destination! The grand canyon is awesome too! I was there for a day in March but I would love to go back and do more hiking. If you get a chance to visit Crater Lake, I recommend it! I lived in Oregon from toddlerhood until I was 18 and went to college and I haven’t been! I am DYING to go. I’ve wanted to for years! I’m from Iowa and loved everything about Oregon. Multnomah Falls. Odell Lake. Oregon coast. And of course Crater Lake is awesome. I still need to make my way over the the Oregon coast. I am going through Iowa on a roadtrip in October. Any tips on things to do there?